Class of 2018. Emory Photo/Video. It's a Friday morning in late March, and the windows of the Office of Undergraduate Admission are spattered with fat raindrops, beyond which gray storm clouds roll. Inside, though, the atmosphere is bright; a sense of energy and excitement floats through the hallway. Boxes of folders, each bearing the iconic image of Dooley, are everywhere—lining the long corridor, stacked on every table, covering the floors of offices. Staff members in jeans and baseball caps are paired up, one reading from a list of names while the other checks the folders. Admission counselors get excited when they find acceptance folders marked for "their" students—those from their geographic territories or their interest groups who they have championed throughout the process. From one office, the voice of pop star Beyonce instructs everyone to "put a ring on it," making heads bob in distracted rhythm. "As soon as we get these in the mail, it's time to celebrate," says John Latting, assistant vice provost for undergraduate enrollment and dean of admission for Emory College, who has just gotten off a phone call with a high-school college counselor. This is "admit day," and it's a big one in the annual cycle of Emory's undergraduate admission process. Several thousand folders shouting "YOU'RE IN!" will be stuffed, sealed, and mailed within about twenty-four hours, bound for the mailboxes of keyed-up high school seniors. 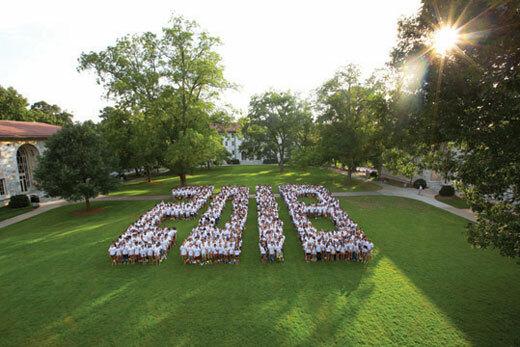 The select group of about 4,500 students admitted to Emory College and Oxford College represents months of intense and dedicated work by the admission team. The colleges received a record number of applications for the class of 2018—Emory 17,822 and Oxford 7,425—and every application is read at least twice. The large applicant pool demands tremendous time and effort by the staff, but it also allows them to shape the strongest possible freshman class by admitting students who are genuinely right for Emory, and for whom Emory is the right place. That's a theme that Latting has been reinforcing since his arrival as dean in 2011. Metrics like test scores and GPAs are important, he says, but they're part of a much bigger picture—and he wants to ensure that his team looks at the big picture of every single student.